The final installment of Anchorage Narratives, "The Enchanted Drum", written by Ademola Bello, will be available in the next issue of Forum Magazine, published by the Alaska Humanities Forum. Ademola's story is a week in the life of a Nigerian immigrant/science fiction author named Deji, set in contemporary Anchorage, as he seeks political asylum. 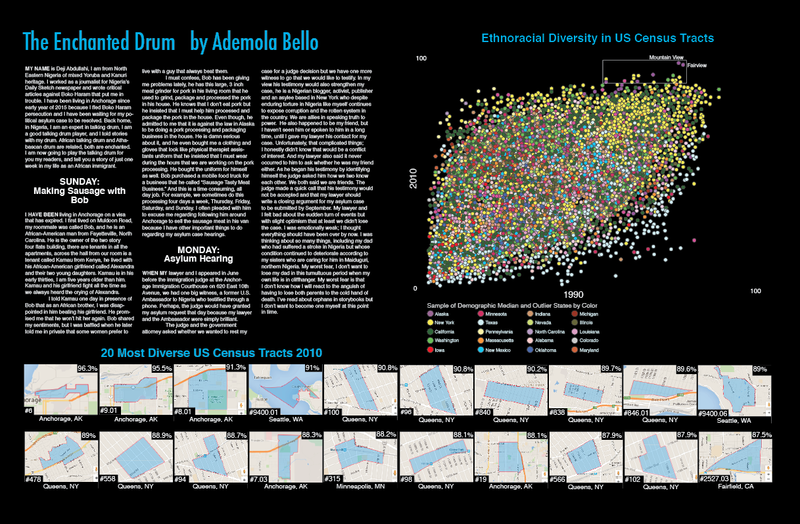 The story is presented with data visualizations of demographic data on the city of Anchorage provided by UAA sociology professor, Dr. Chad R. Farrell. The third of our Anchorage Narratives, Mudcakes and Shrew will be available in the next issue of Forum Magazine, printed by the Alaska Humanities Forum. It is written by Dawnell "Wickedspeedia" Smith. Dawnell has written a story about a mother and her daughter during the great earthquake of 1964. 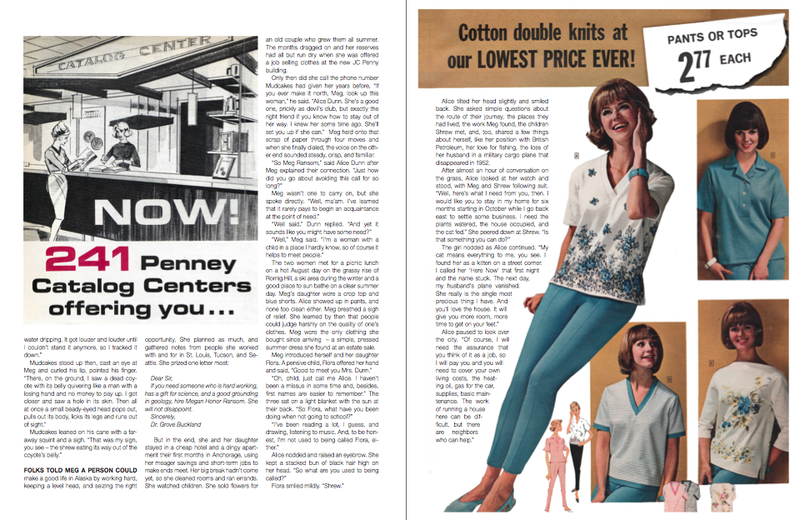 The interactive print version is presented as a JC Penney catalog. View PDF of Smith's "Mudcakes & Shrew". The second of our Anchorage Narratives, How We Made Summer Fish Camp will be available in a couple weeks in the next issue of Forum Magazine, printed by the Alaska Humanities Forum. It is written by Angela Yatlin Gonzalez with Dena'ina Cultural Consultation by Aaron Leggett. The story tells the story of a summer fish camp as known by a young Dena'ina girl named Ashana in the summer of 1919. 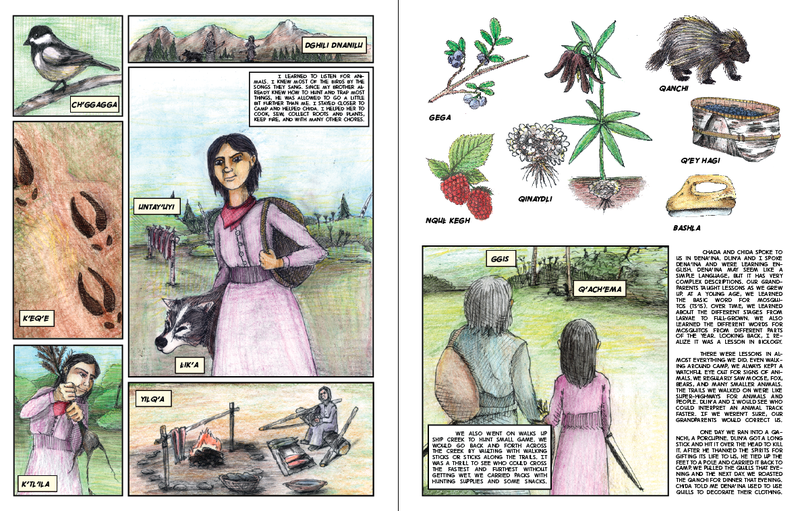 It is presented in a graphic novel style with illustrations and augments by Nathan Shafer. View PDF of Gonzalez's "How We Made Summer Fish Camp". The first of our Anchorage Narratives, Paid in Kind is available in the Spring/Summer issue of Forum Magazine! This is an interactive print version of the story, with embedded videos, historical photos and audio tracks of Kris Farmen reading his story. The story is set in 1915 Tent City Anchorage. Historical addenda is written by Steven C. Levi. View PDF of Farmen's Paid in Kind. Anchorage Narratives is a four part augmented reality (AR) walking tour and interactive print project for the City of Anchorage, commissioned by the Anchorage Centennial Committee and the Alaska Humanities Forum for the Anchorage Centennial in 2015. Each of the four stories is told by a different author who calls Anchorage home: Angela Gonzalez, Kris Farmen, Dawnell Smith and Ademola Bello. Every story follows a different person as they experience very different days from Anchorage's history beginning with a Dena'ina summer fish camp story at the close of the 19th century and ending with a Nigerian immigrant in present day Anchorage. Every story will be featured in Alaska Humanities Forum Magazine, beginning in Spring 2014. This project is designed for the two most popular AR browsers as of 2014: Junaio and Layar. To view the work, simply download either Junaio or Layar and scan Forum magazine for content. For more about augmented reality, please follow this link.